2018 will be over before you know it – we know it’s hard to believe! Now is the time to review your marketing strategies, see what worked (and what didn’t!) and prepare for the new year. One great thing to start tracking is Google trends – what are people searching? This can show you some new topics to address on your blog, keep track of your industry, and more. 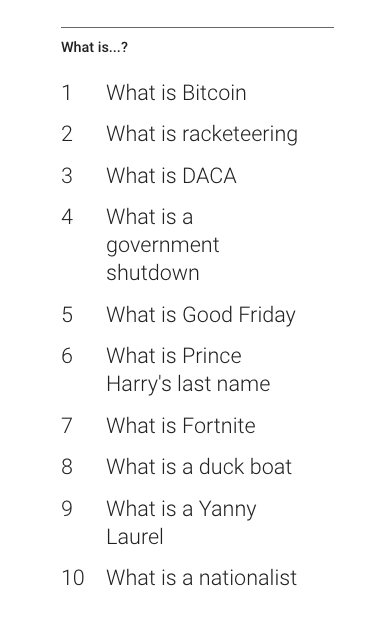 For a little fun to end the year, take a look at Google’s report on the Most Popular Search Terms for 2018. The lists, which cover everything from food to fashion to sports teams, are based on search terms that had the highest spike this year as compared to the previous year. Clearly, this was a year where we were interested in politics, extreme weather, sports, and the lottery. Did you search any of these things in 2018? The top food and top GIF entries are particularly interesting. The US has more interest in marijuana edibles, fun, crazy foods, and health. Plus clearly Fortnite has really taken over. Keeping an eye on Google search trends is a great strategy for finding topics for your content marketing. How can you use Google search trends for your SEO strategy? Try typing in your own phrase. Maybe an industry topic, or maybe a phrase you just keep hearing around. We tried typing “digital marketing,”and got a pretty thorough view. As you poke around, you can look at the search volume for the last 12 months, or over many years. 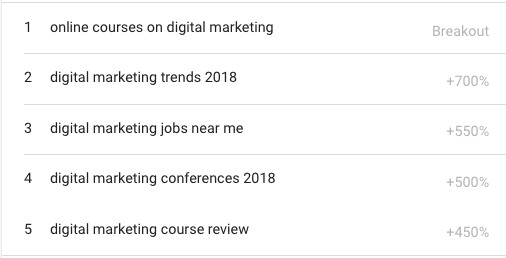 In our search of “digital marketing,” you can see a clear increase in volume over the last 5 years. While no one can predict the future, by playing around with this tool, you can start to see what keywords will be trending next year. If you find some promising phrases, start writing them down. When it’s time to create your next blog or video, try focusing the content around this keyword. These trends could even convince you to build an entire new division or product offering for your business. Are you a bakery seeing that increase in searches for “unicorn cake”? Then adding that sparkly creation to your menu might be a smart move. Get more guidance on your SEO and keyword creation by contacting us today for a consultation.